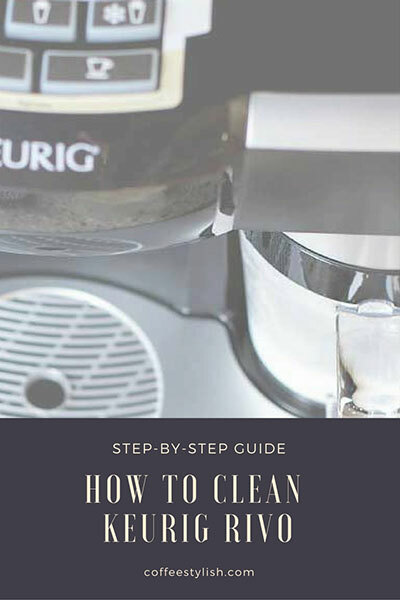 A detailed how-to on how to clean your Keurig Rivo machine to make it shine and keep it running efficiently. Please, thoroughly clean all components of the frother after each use. You can place them in the dishwasher or wash by hand with warm water. With espresso machines, it’s really important to take a good care of all the parts that come in contact with milk so they wouldn’t develop a bad smell, caused by milk protein build-ups. You can even use a special dairy cleaners like Rinza from time to time to really keep it nice and clean. Simply pour 1 oz Rinza in the frother, fill the rest with water and place the pitcher in its place. Run latte froth button, then let the machine sit for 15 – 20 minutes. Then, remove the pitcher and rinse thoroughly. 1. Empty the drip tray and pod bin. The machine will automatically push down an empty pod into the pod bin, once you open the handle. To remove used coffee pods from Rivo cappuccino & latte system, pull out the drip tray and the bin will come out with it. Clean and dry, then place back in its place. 2. It’s recommended to run a rinse cycle every week (or after 10 – 12 beverages). To run a rinse cycle, place a mug on a drip tray, close the handle without inserting the pod and press the lungo button. Repeat twice. Discard the water from the mug. 3. Wipe the external parts of the brewer with a damp cloth. Descaling is important. It helps clean mineral build-up inside your machine and can help with poor performance. It keeps your machine in a good shape and ensures good tasting coffee. The descaling process should be done every 3, 4 months, depending on the mineral content of the water in your area. For this purpose, you can use white vinegar, special Keurig Descaling solution or a similar commercial descaler. 1. Pour 1 bottle of Keurig Descaling solution and 14 ounces of water into the reservoir. Turn on your brewer. 2. Place a mug/ pitcher on a drip tray and start dispensing the solution using the lungo button. Open the handle, close and press lungo button, without inserting the pod. Repeat the brewing step until the control panel lights up in a circular pattern. Remove the water tank and rinse well. 3. Fill the reservoir with clean water only and rinse again using lungo button. Repeat this step until you have completed at least 12 brews. 4. Wipe the machine and all removable parts, fill the reservoir with clean, fresh water and you’re ready to brew. Your espresso machine is an investment and you should try to make it last. Proper care and maintenance can offer a big payoff for just a little bit of work! Need to replace the plunger device at the end of the hot water line. The plunger is frozen solid in mine. Where can I get this part? Hi dood i have a K latte, but i dont know how to remove the whisk from the frother so i can clean it, no orher place seems to address this… do i pull it out? It wont break? Or is there a button of sorts? Hi Prinny, sorry for the late response. That is correct, you just pull out the whisk so you can clean the frother. Here’s a video showing how to quickly clean your K-Latte. I hope this helps! Hi, my Keurig Rivo machine is beeping. Every 2-3 mornings when I put the froth ON the system starts beeping and the only way to stop it is to unplugg the system and restart it. Why do I have this long unstoppable beep. Hi Martin, the Rivo usually beeps if the frothing pitcher is not placed properly or when the water tank is empty. If you hear 3 beeps after you’ve placed the frothing pitcher and selected the frothing mode, it’s the pitcher. Remove the pitcher and re-insert to ensure it’s placed properly. If the machine stops brewing and there is series of beeps and the buttons are flashing, then it’s a water tank. Simply refill the water tank and press the last used button to continue brewing. If this doesn’t help or there is just series of beeps even if you’ve refilled the tank and you inserted the frother properly, please call Keurig customer service for further assistance at 866-901-2739. I hope this helps! Amazing – after four months of mopping up water/coffee water in my Rivo (and under the Rivo) after every few cups, I finally solved the problem of leaking. I have owned the Rivo (a gift) since August 2017, and everything was fine until mid-February, when I noticed water seeping from under the machine. Mopped it up, same thing every couple of brews from then on. Today I decided I was either going to find and fix the problem, or the machine was out of here. The answer (in my case) was a coffee blockage inside the plastic chute (which has a small rubber pointed “thing” hangng down from it. Remove the whole drip tray and look straight back inside to see the rubber pointy “thing”, it is attached to a half circle chute. This was blocked, so the water has to go somewhere so it pours down the back wall of the machine, missing the drip tray completely and thus causing a leak from the two slots where the drip tray sits. If you look at the coffee container in the drip tray, you will see a cutout at the back, this is where it sits under the half circle chute and rubber pointy “thing”, and the water then goes into the drip tray. If I have muddied the waters, or not provided clear enough information/explanation, please let me know, as I will check back on this site in a few days, and try explaining better, if necessary. We are on our second RIVO machine we descale and clean it but now the lid pops open whenever we try to make a drink. We have also noticed water leaking from the bottom of the machine. we have to hold the lid down to make an espresso!? Hi Vince, make sure the pod bin is empty and there’s no pod stuck in the machine and try this fix: open the handle and push it all the way back (even beyond the point of the initial tension when you would normally stop). This should reset the handle in the correct place and make sure it’s properly aligned. If this doesn’t help, there is a chance that something is wrong with the water hose or the pressure valve in the machine, or the handle is broken. If that’s the case, I recommend calling Keurig Customer Service at 866-901-2739. I got mine 2 month ago and the milk frother is not working anymore. The milk just get hot no foam. What kind of milk are you using? That happens to me if I use 1 % milk but works fine with 2 % milk. My Rivo will brew but it brews into the pod bin, not through the typical hole. Can anyone help me trouble shoot please. Hi Renee, try cleaning the brew nozzle with a paper clip to make sure it’s not clogged with grounds (don’t forget to unplug the machine first). I also recommend cleaning and descaling your machine. You can also try this fix: push the handle all the way back then close it again, to make sure it’s properly aligned and it’s not stuck somewhere. If this doesn’t help, there is a chance that something is wrong with the water hose or the pressure valve in the machine. If that’s the case, I recommend calling Keurig Customer Service at 866-901-2739. My friend can’t retrieve the pods in her Rivo. I think the door is stuck, but we’re unable to even know how the door opens. Hi Mary, please check the used pod bin and try removing the pod from the bottom. First, unplug the machine, then take out the drip tray (the bin will come out) and check both top and bottom side of the pod opening. Try pulling it or losing it out with light pressure. There are needles inside so please don’t use your fingers, but some tool like a paper clip or a knife. I ended up calling the help line. I needed to understand how the door opened in order to try to get it opened. We discovered that it was stuck shut due to the number of pods in there. With some shaking and pulling, I was able to open the door. Thank you for your help. You are welcome, thank you so much for the feedback. Happy holidays! Hi Cathy, there are a few things you can try. First, remove the water reservoir and hand wash it with mild detergent. Set aside. Unplug your machine, turn it upside down shake a bit and hit the bottom few times – if there are some particles clogging the water pump or water hose they should come out. I would also clean top and bottom exit needles to make sure the exit needles are not clogged. When you finish, fill the reservoir with clean water and put the reservoir back. If this doesn’t work, you will need to call Keurig Customer service. Customer service help is available 7 days a week at 866-901-2739. Descaling your machine is always a good idea but you can try these solutions first. I hope this helps! My machine is only using half water thru pod and most goes in the drip tray. Is it an easy fix or is it time for a new machine? Hi Sheila, I recommend to clean and descale your machine. This usually helps. If there are still any unusual leaks even after you have descaled your machine, please call Keurig customer service at 866-901-2739. Hi Richard, with this type of machines, a small amount of grounds at the bottom of the cup is normal. They are usually very fine and they don’t mess up the coffee taste/ texture. But, if you’re getting a really messy result or bad cup of espresso, then you can call Keurig customer service to help you troubleshoot your brewer. My machine will not make any coffee. When I turn it on and press the button for either short or long shot it will start but now water goes into the machine to make the coffee, I have the water reservoir in correctly. It tries to make the coffee, when it doesn’t the lights just go around in a circle and beeps on the long shot. Any suggestion? Hi Tracey, mine is doing the same thing this morning. I noticed you didn’t receive a reply so I don’t know if there’s a solution or if this is the end of life. I haven’t really used mine that much. Hi Debbie and Tracy, I am also having the same issue. When I turn it on and press the button for short shot, it will start but no water goes into the machine to make the coffee, I have the water reservoir in correctly. It tries to make the coffee but when it doesn’t the lights just go around in a circle and then there is a long beep. This only happens on the short shot. But when I press the long short, nothing happen. I haven’t used it for a while. Can someone from Keurig please respond? Would really appreciate it. Thanks. I do wish someone would help us. I was telling someone about the problem and they had a similar problem with a regular Keurig. They said they turned it upside down and I used a straightened paperclip to clean the hole. It was full of debris and it solved the problem. I’ll let you know if it fixes my Rivo. Hey, I fixed my Rivo! I turned it upsids down but couldn’t find any build up that would be blocking the flow. I did discover that the pod hadn’t neen pierced as it should have been to allow the water to flow through the pod and into my cup. I cleaned the sharp “stakes” that pierce the pod and tg2at fixed it! Water flowed through and I into my first cup of espresso in a while. Check yours. This fixed mine too! Thank you! How did you clean the needle? Kendall, I just used a paper towel to remove the build up. I’m having an issue with the frothing process doesn’t matter if I have it on Latte or capachino there is little froth. I’m wondering if rescaling the machine might help this issue? Hi Ellen, I don’t think descaling can help with this issue because it only removes the calcium deposits from the machine and I don’t think that’s the problem. Please check to see if the rubber stopper is all the way up or in contact with the lid. There must be a space between the lid and the stopper, so slide it down a little bit. This might help. Also, what type of milk do you use?! The Rivo makes the best froth with whole or 2% milk and the milk needs to be cold when you add the milk. If you’re using dairy free options like almond, rice or soy milk they don’t froth very well. If the rubber is in its place, you’re using whole or 2% milk, the milk is cold when you add it to the frother and the milk is between min and max line, but it still won’t froth, please call Keurig customer service at 866-901-2739 to help you troubleshoot your machine. My milk no longer heats when I froth it. If you use regular (not cold froth) button, then the milk should always be worm. Since that’s not the case, you should call Keurig customer service and ask them to help you troubleshoot the machine. Keurig Customer Service help is available 7 days a week at 866-901-2739. I as well am having problems with my frother, it started about 2 months after we bought it, and now it just clicks, eventually it will start if we cut the machine on and off, but there is no quality to the froth just warm milk. Are there parts that need to be replaced? My Rivo Frother will not work at all! I put it position and push button to froth and I get nothing! What do I do?? My brewer handle will no longer close. any suggestions? Hi Marcy and sorry fot the late reply, I was out of the office. Sometimes, the handle won’t close if the rivo pack didn’t fit well, so you need to lift the handle, adjust it and close it again. Also, make sure the pod bin is empty, because this can cause a problem too. You can try removing and placing again the rivo pack bin & drip tray just to see if it’s placed properly. If everything seems fine, the bin is empty, drip tray and the pod looks fine and are in the right place, but it still won’t close, then it’s best to call keurig customer service and ask for instructions. 1.866.901.BREW (2739). Let me know if you need anything else. How do I replace the filter on my Rivo? Hi Marsha, as far as I know there is no water filter in the Rivo machine. Keurig Rivo doesn’t use a filter. Also, the available Keurig water filters (the one for k-cup machines) won’t fit. Keurig just recommends using bottled water.